Many Persicaria plants share two common features: showy leaves and an aggressive nature. Persicaria polymorpha, or Giant Fleece Flower, doesn’t have showy leaves, but you’ll never miss them. And it tends to be quite well behaved in the garden. Fleece Flower blooms in early summer and goes on for more than a month, getting taller and taller along the way. Although Giant Fleece Flower looks like a shrub, it grows like a herbaceous perennial, dying back to the ground in winter. However, it makes up for it by quickly growing upwards of 6 ft. tall and almost as wide, the following season. Giant Fleece Flower stays in a well-behaved clump and rarely seeds or spreads by rhizomes. It is widely adaptable and requires little maintenance. Persicaria polymorpha is sometimes confused with Polygonum cuspidatum or Japanese Knotweed, which is considered an invasive plant. There is no research to suggest that Persicaria polymorpha should be grown with caution since it is a clump former and does not travel in the garden. Leaves: Dark green, alternate pointed leaves have slightly serrated edges. The stems are sturdy but may need some support by the end of summer. 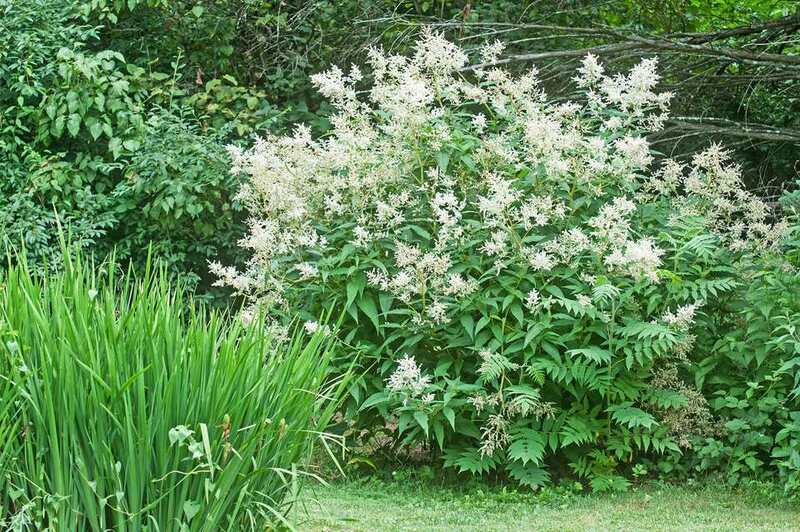 Flowers: Astilbe-like white plumes are popular with butterflies. The late season seed heads are also attractive. Giant Fleece Flower is a reliably hardy perennial in USDA Hardiness Zones 5 - 9. You can grow Giant Fleece Flower in full sun to partial shade, but you'll get the best flowering if the plants get at least 5 - 6 hours of sun per day. Too much shade can make this very tall and top heavy plant floppy. It can take a year or two for Giant Fleece Flower to reach its mature size, but once it does, expect a bushy 4 - 6 ft. (h) x 4 - 8 ft. (w). It will bend slightly toward the sun, but should not need staking. The flowers start in early summer, (May-June) and peek shortly after. The plumes will persist until fall when they then produce attractive seedheads. To date, there are no cultivated varieties of Persicaria polymorpha. Because of its size, Giant Fleece Flower will make a statement anywhere in the garden, but it’s white plumes make it especially useful for a partial shade garden. It’s great for any border that needs a vertical accent and also works well with several planted together as a screen or to block a view of something like an air conditioning unit. Just be sure to give your plants plenty of room. They will fill out quickly. Soil: Giant Fleece Flower is easy to grow and widely adaptable. It can tolerate dry periods and is not particular about soil pH. Planting: Giant Fleece Flower is generally grown from divisions. You probably will not find seed for sale. Plants can be hard to find in nurseries but ask for it. The young plants don’t look like much, but a small clump with quickly fill out and blossom. Giant Fleece Flower requires very little maintenance. It has average water needs and will adapt to most soils. Although it enjoys moisture, it does not like to sit in wet soil, Once established, Giant Fleece Flower is moderately drought tolerant. Cut back the old, dead foliage in early spring, before new growth starts. The thick stems are hollow and cut easily. You could probably prune it back in the fall if you prefer, but It looks so good in the fall that you may want to keep it standing. If you want a shorter, bushier plant that blooms later in the season, you can shear the entire plant in late spring, as you would with other fall bloomers such as asters. No regular deadheading is required, to keep it blooming. As the plumes age, they will turn a pinkish mauve and eventually develop seedheads. Giant Fleece Flower is virtually problem and pest free. This is a very undemanding, easy to care for plant that will make a lovely statement in your garden.